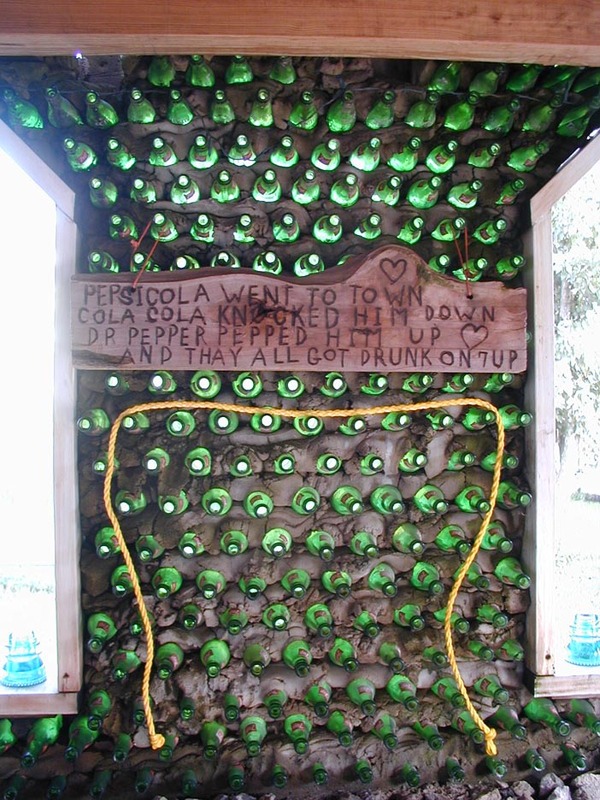 I received so many positive responses to the Bottle Wall piece that I thought I would do a brief follow up. Starting with this amazing photo of the artist Charles Stagg in his home in Vidor, Texas. Charlie Stagg is an East Coast educated but Texas born and bred artist who created this house starting in the 1960's. 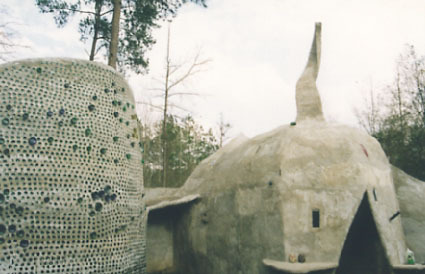 From his home in Texas he has created his artwork and built onto this house for some 40 years. 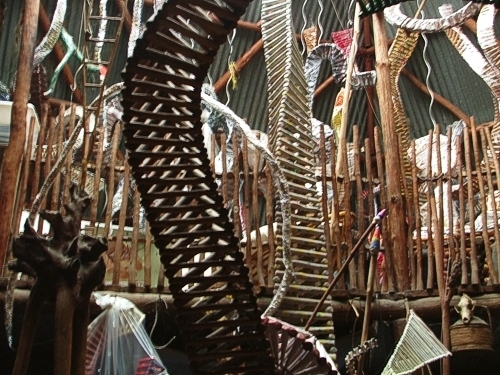 A picture of his studio and his artwork. The studio apparently burned down in 2006, though most of the house remains intact. I received this image of a work-in-progress from Ricky of Luna Parc. Great idea to do all blue bottles. Can't wait to see the finished structure. 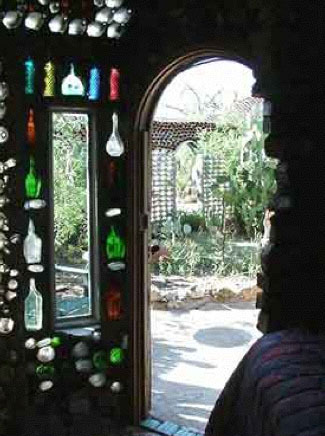 This is Anna's Bed and Breakfast near Tucson, Arizona. and a part interior, part exterior shot. I like the use of the upright bottles in this one. Rockome Gardens is the one of the few places that discriminates as regards the brand of bottle used. i.e. 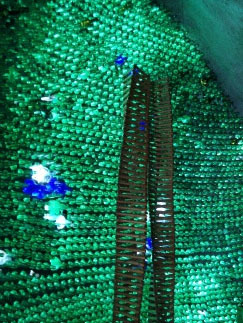 - these are all Fresca bottles. 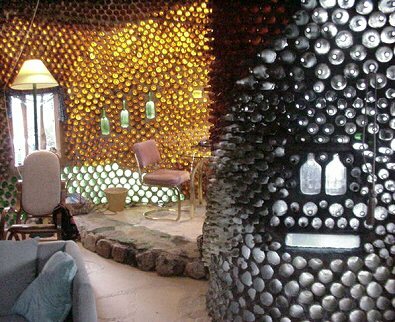 and these are all 7-up bottles. 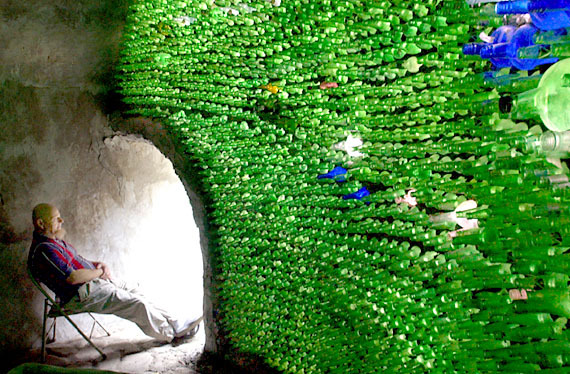 It does make me wonder why the Coca-Cola bottle, with it's distinct shape, has never been used for a bottle wall. 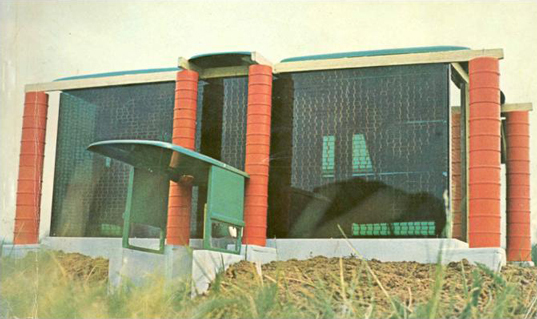 I had intended to put the Rockome bottle houses in the original bottle wall post but thought better of it since, sadly, these structures no longer exist. 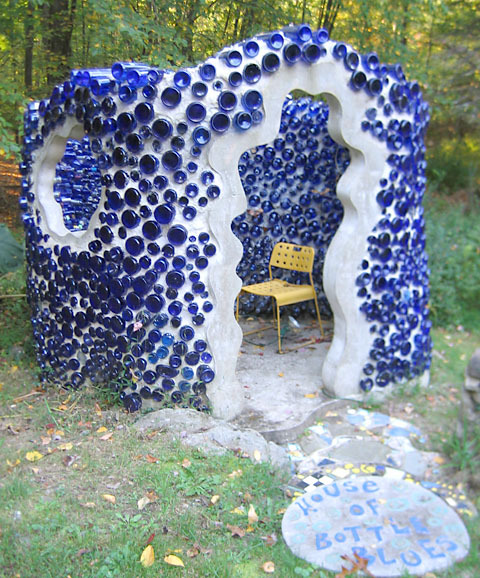 Acquired by new ownership and not deemed to be a part of their vision for the property (some kind of Amish-themed Park), the new owners demolished the bottle houses in 2006. 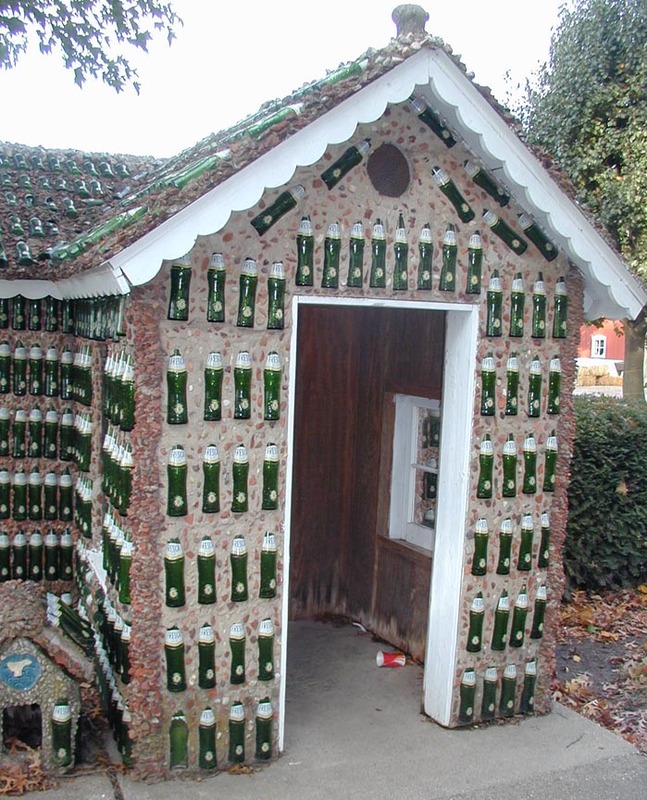 John Makinen built this bottle house in the 1940's in Kaleva, Michigan with bottles from a local bottling plant. 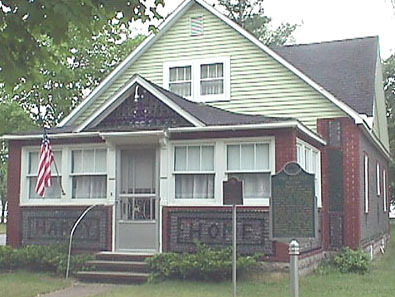 It now houses the Kaleva Historical Museum. I like the incorporated text. I found the closeup via the amazing and wonderful agilitynut flickr pages. 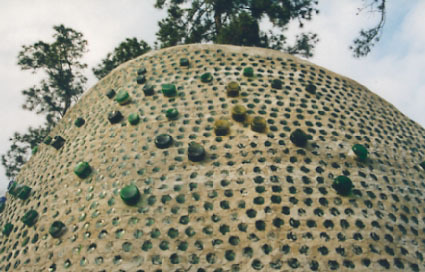 If you like Roadside Attractions (including Bottle Houses), this is the place to go. As the story goes, Alfred Heineken had an epiphany while on a world tour of Heineken factories. 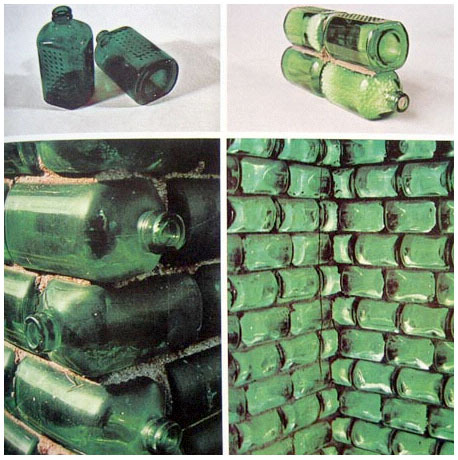 When Heineken was on the Caribbean island of Curacao in 1960 he saw many bottles littering the beach due to the fact that the island had no economic means of returning the bottles to the bottling plants from which they had come. He was also concerned with the lack of affordable building materials and the inadequate living conditions plaguing Curacao's lower-class. Envisioning a solution for these problems, he found an architect to design what he called "a brick that holds beer." Notice how the bottom of the bottle is recessed so that the neck of the bottle would fit snugly into the bottom. There were apparently 2 sizes, roughly equating to the idea of the brick and the half brick. 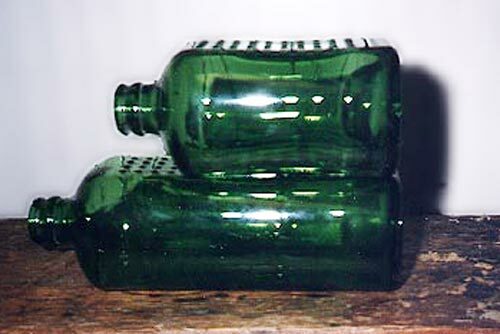 The bottle was designed by Architect John Habraken. They did manufacture the bottle but never released it commercially. 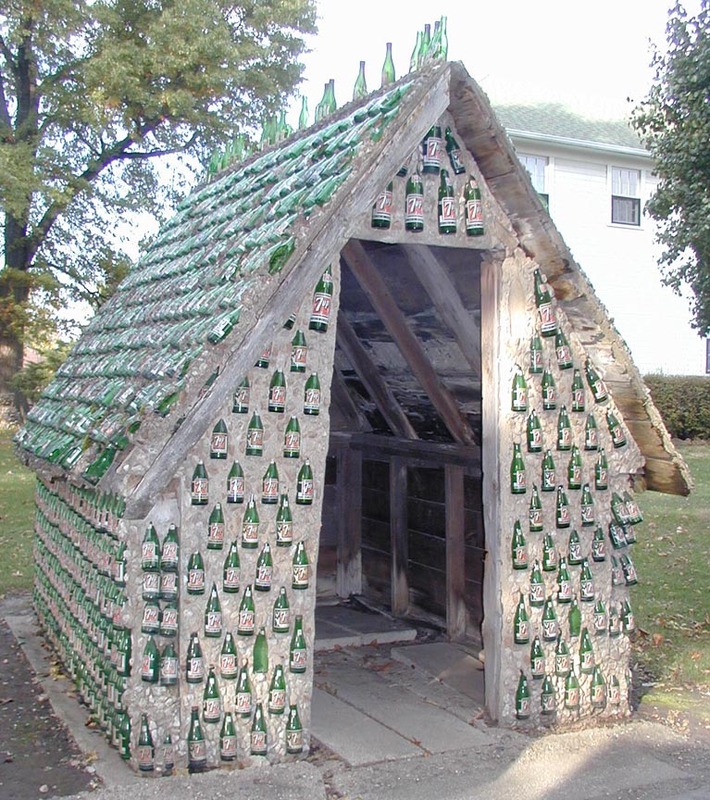 Nothing much came of it and there are apparently only one or two existing structures, on the Heineken estate, known to have been made from the bottles. 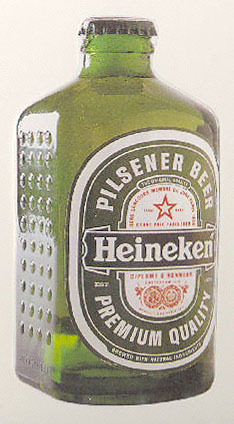 Rumor has it that there are some 60,000 of these bottles in storage somewhere in the Netherlands. Looking at it I'm not surprised the idea failed. It seems almost an impossible balance - the basic utility of holding beer, balanced with the idea of 'brand identity' as well as the idea of 'sound building material'. Still, it's interesting to see that it went as far as it did and it definitely strikes me as an idea ahead of its time. 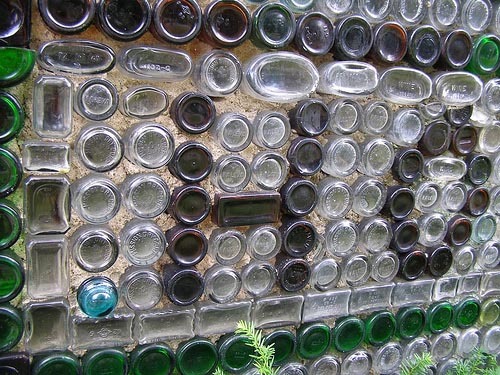 I've been asked - are there any resources to let me know how to build a bottle wall? I've searched on the web and so far, no luck. Though I did find this case of a team of people trying to build a bottle wall. Though on close reading it comes off more as how not to build a bottle wall.